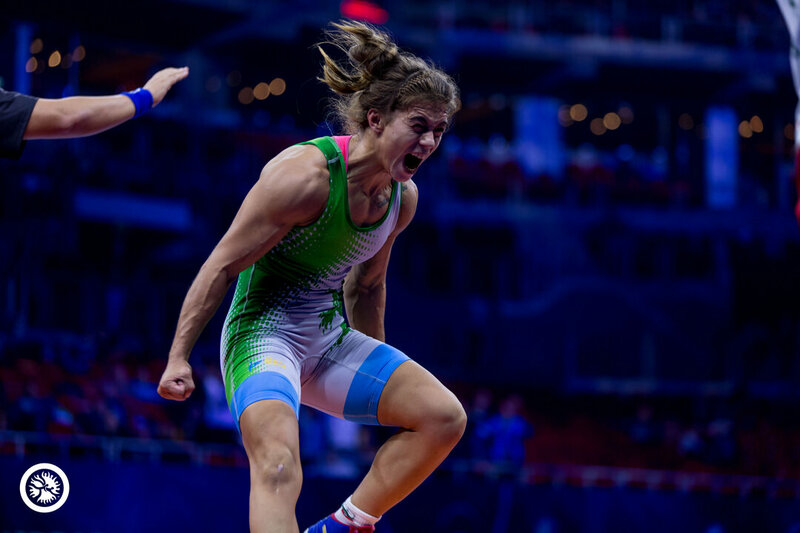 BUDAPEST, Hungary (October 25) -- A pair of 19-year-olds repeated as world champions and closed out a dominating team performance for Japan in women's wrestling at the World Championships in Budapest, Hungary. Yui SUSAKI (JPN) and Haruna OKUNO (JPN) both won by technical fall in their gold-medal matches on Thursday to give team champion Japan two more gold medalists in women's wrestling and four overall in Budapest. Susaki made it two senior world titles in two tries as she dominated three-time Olympic medalist Mariya STADNIK (AZE) 10-0 in the gold-medal match at 50kg. She scored the first takedown by countering a Stadnik attack. Susaki then used a gut wrench to go up 4-0. Another takedown by Susaki made the score 6-0 at the break. She then ended the match with a takedown and gut wrench. Susaki completely dominated her competition in Budapest, winning by fall in her first match and then picking up three straight technical falls without surrendering a point. In addition to the two senior world titles, Susaki has won a junior world title and three cadet world titles. Okuno cruised to a 10-0 technical fall over top-seeded Sarah HILDEBRANDT (USA) in the gold-medal match at 53kg. The match was competitive early with Okuno leading 2-0 at the break. But Okuno turned it up in the second period, picking up three takedowns and a turn to close out the technical fall. Taybe YUSEIN (BUL) denied Japan a third gold medal on Thursday as she defeated Yukako KAWAI (JPN) 6-2 in the gold-medal match at 62kg. It's Yusein's first world title after coming close multiple times. The 27-year-old previously won two world silver medals and two world bronze medals. Yusein scored a takedown a minute into the gold-medal match and used a trap-arm gut wrench to quickly go up 6-0. The score stayed that way until the final seconds when Kawai added a late takedown to avoid being shut out. Ningning RONG (CHN) came through to win the world title at 57kg, edging top-seeded Bilyana DUDOVA (BUL) in a battle of returning world fifth-place finishers. Dudova scored first off the shot clock, but Rong took the lead after scoring a point off a caution. The 21-year-old Rong added to her lead in the second period with a takedown. Dudova scored a late two but Rong held the criteria and captured the gold medal. Yanan SUN (CHN) added her forth world-level medal, claiming a bronze medal at 50kg with a 10-0 technical fall over Sonhyang KIM (PRK). She now has world medals in each of the colors to go along with an Olympic bronze medal. Oksana LIVACH (UKR) won her first senior medal after winning three junior world medals and two cadet world medals. She topped Ritu RITU (IND) 10-5 for a bronze medal at 50kg. The bronze medals at 53kg were won by Diana WEICKER (CAN) and Qianyu PANG (CHN). Weicker defeated multiple-time world medalist Zhuldyz ESHIMOVA (KAZ) 3-2. Pang edged Katarzyna KRAWCZYK (POL) 2-1. At 57kg, Pooja DHANDA gave India its first women's freestyle world medal in six years by defeating Grace BULLEN (NOR), a junior world medalist and cadet world champion, 10-7 in the bronze-medal match. Dhanda used two four-point moves -- one in each period -- to pace her to the victory. Emese BARKA (HUN) gave the Hungarian fans something to cheer about as she captured her third bronze medal by shutting out Kateryna ZHYDACHEVSKA (ROU) 6-0 at 57kg. Yuliia TKACH OSTAPCHUK (UKR) halted Hungary's bid for another medal in women's wrestling as she shut out 2013 world champion Marianna SASTIN (HUN) 2-0 in a bronze-medal match 62kg. Tkach has now won world medals in two straight years as she won a silver medal in Paris. Mallory VELTE (USA) defeated Lais NUNES DE OLIVEIRA (BRA) 2-1 in the other bronze-medal match at 62kg to give USA its fourth medal in women's wrestling this week. Velte scored both of her points off the shot clock. Japan finished with 156 points to take the team title in women's wrestling. China finished second with 119, followed by the United States with 103.